I’ve been thrilled to have Candlewick Press pick up some of my work for US publication over the last year. There are all sorts of reasons why this is a good thing for me professionally, and those probably go without saying. Lately, though, I’ve been on the receiving end of some more unexpected benefits. Letters! Actual letters coming to me from kids in the US. 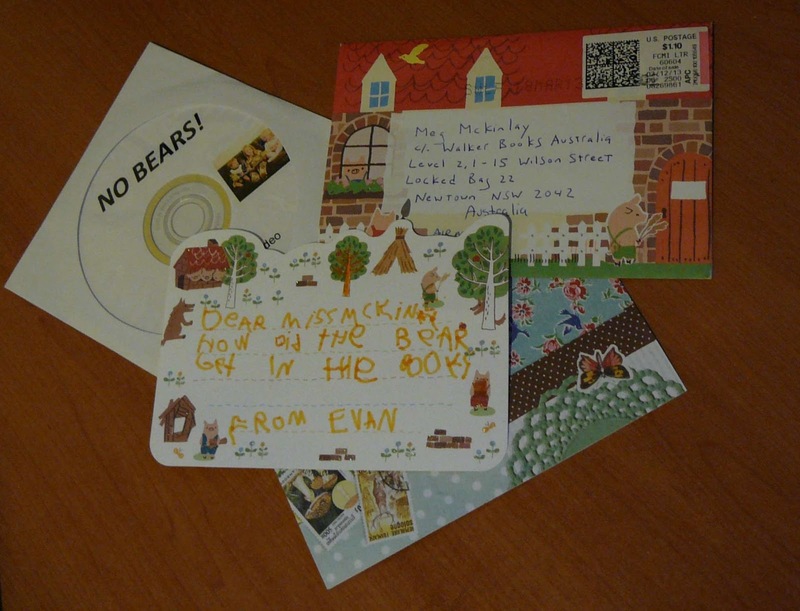 I get a bit of mail from kids here in Australia, but contact often tends to come via email. I’m not sure why that might be; perhaps there’s something exciting about the idea of picking up an actual pen (or texta) and sending a letter across the world. I know I’ve been having lots of fun writing back. This photo is of a couple of my recent favourites – one is a DVD that came from a family in North Carolina. They wrote that they had enjoyed No Bears so much they decided to act it out for their annual Christmas video, which is sent to family and friends, and also, this year, me! Their interpretation of the story, complete with costuming, sets, and blooper reel at the end, had me in stitches. I had never imagined a 2-year-old boy in the role of monster, but somehow he was absolutely perfect. And to have the story narrated by a real-life Ella was simply the icing on the cake. The other letter here is from a young reader in Illinois, who was very keen to know how the bear managed to get into Ella’s book without her noticing. This is a question I have asked myself many times, of course, and I hope I was able to answer in a satisfactory way. My middle-grade novel Below is due out in the US in mid-May, but I am a bit less optimistic that its readership will be sending things like this through the post. However, if anyone wants to act it out for their Christmas video, I would be very intrigued to see the results! This entry was posted in Below, Junior Fiction, No Bears, Picture Books on April 15, 2013 by Meg McKinlay.